Walls : Raleigh Peach, CW-205. Panelling : Ambler Slate, CW-685. As the summer fades to autumn, our attention turns back to the interiors of our homes and completing interior projects before the busy Christmas period begins. We've put together a look book featuring the very latest schemes and styles to give you some design inspiration for your autumn projects. For more inspiration, check out the "Be Inspired" pages on our website. Warm and clean Simply White OC-117 is used on the walls to give this living space a bright and airy feel. Wolf Gray 2127-40 is used on the doors. Stone White 2120-70 on the upper walls and ceiling accentuates the fabulous height of this room. 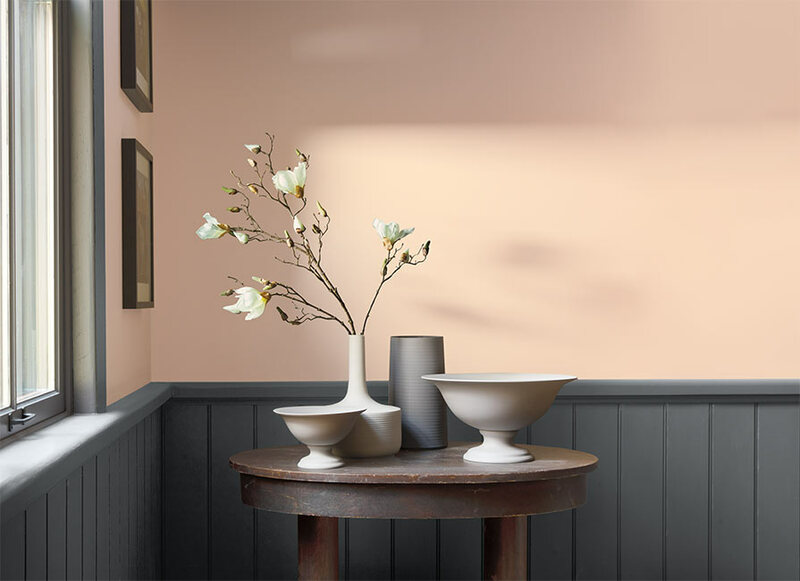 Dior Gray 2133-40 is used on the lower and rear walls to unify the scheme. 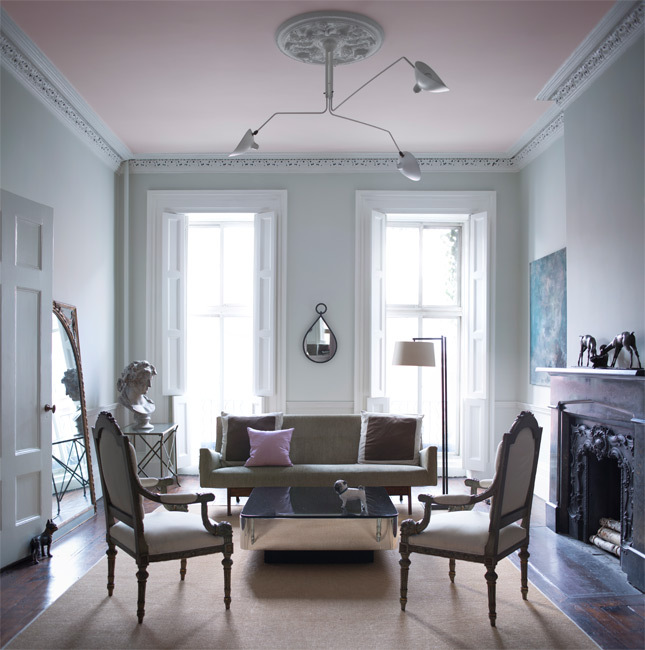 This elegant space uses Powder Pink 2009-70 on the ceiling alongside the classic Stonington Gray HC-170 on walls and woodwork. Revere Pewter HC-172 picks up the warm wood tones to give a bright yet soft feel in this living room. Cloud Cover OC-25 is used on the woodwork and ceiling. 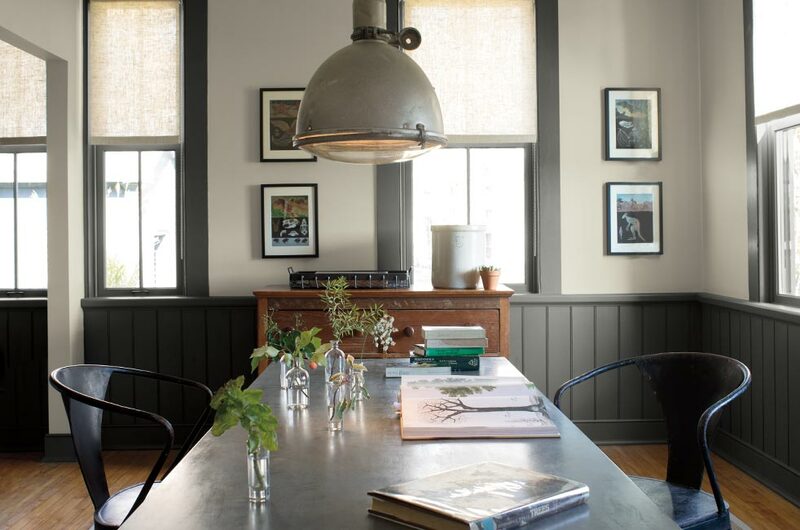 This striking contemporary scheme uses Palace Green CW-520 on the walls and Geddy Gray CW-720 on woodwork and panelling. Bright and sun-filled, this monochromatic space features Slate CW-700 on the walls and Capitol White CW-10 on the woodwork and panelling. Mopboard Black CW-680 on the dining chairs completes the contemporary look. Geddy Gray CW-720 is a beautifully balanced grey paint, inspired by the simple mixing of black and white pigments from the 18th century. Here it is paired with Bruton White CW-710 on the walls. 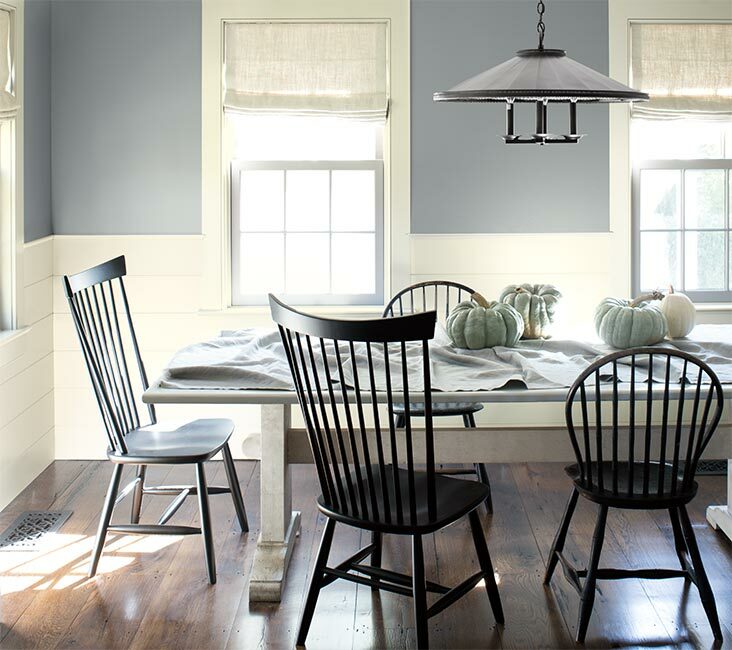 This classic dining room gets a contemporary twist by using Gentleman's Gray 2062-20 on the walls, woodwork and doors. This creates a beautiful and confident look for your dining area perfect for entertaining. 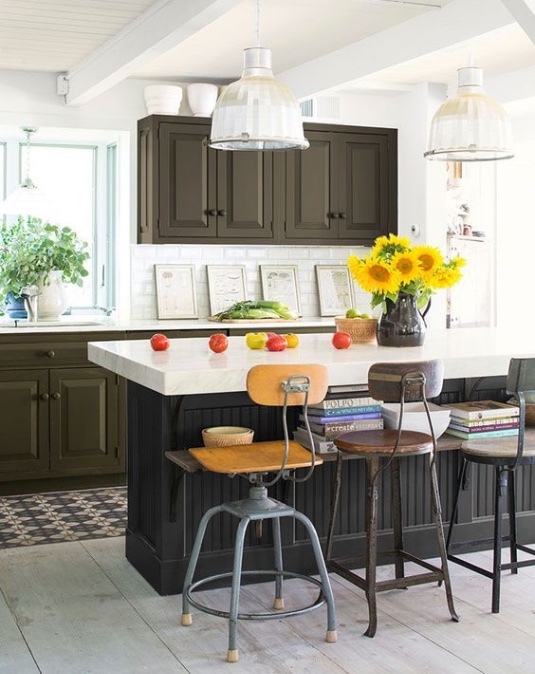 The rear cabinets are painting in Southern Vine 2138-10 and the island cabinets feature Blacktop 2135-10. The ceiling colour is Atrium White OC-145. This Butler's Pantry uses Hancock Gray HC-97 on the walls alongside Chantilly Lace OC-65 on the woodwork for a crisp yet warm look. 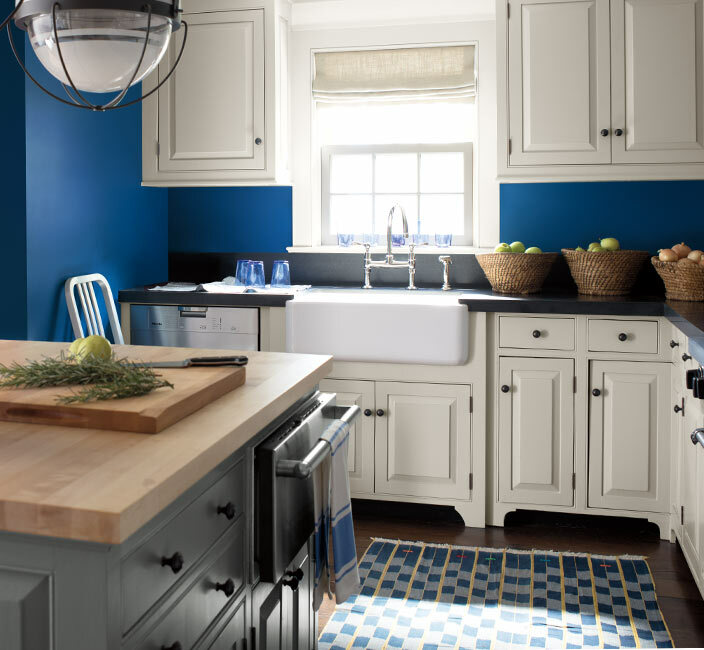 Inspired by the blue-and-white porcelain that was popular in traditional 18th century homes, Prussian Blue CW-625 adds a refreshing pop of colour in this kitchen. The wall and base cabinets feature Bruton White CW-710 and the island cabinets use Geddy Gray CW-720. For a spa-like feel, complement Decorator's White OC-149 on the walls and add colour to the ceiling, like the relaxing shade Buxton Blue HC-149. 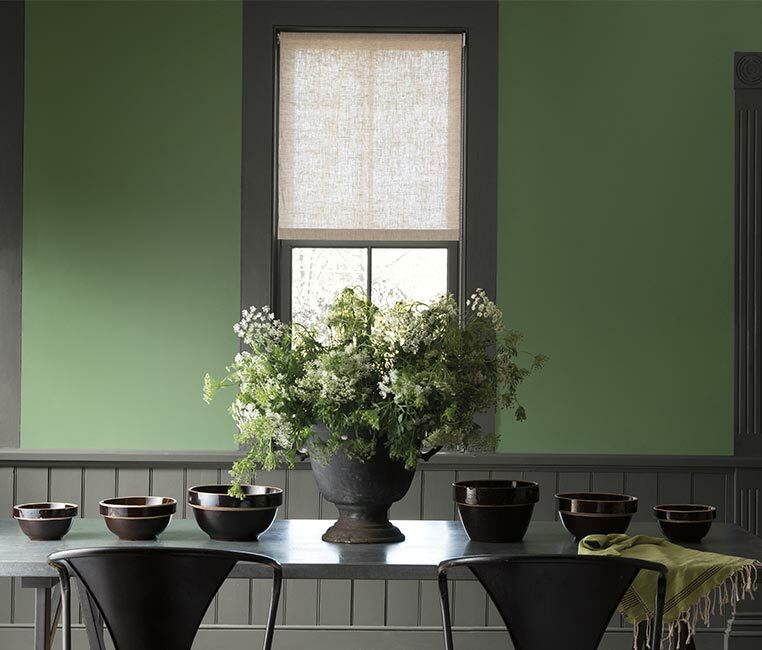 This dark neutral, Flint AF-560, draws the eye to create a beautiful focal point and highlights the design elements as well as the outside view. The cabinets are painted in Simply White OC-117. 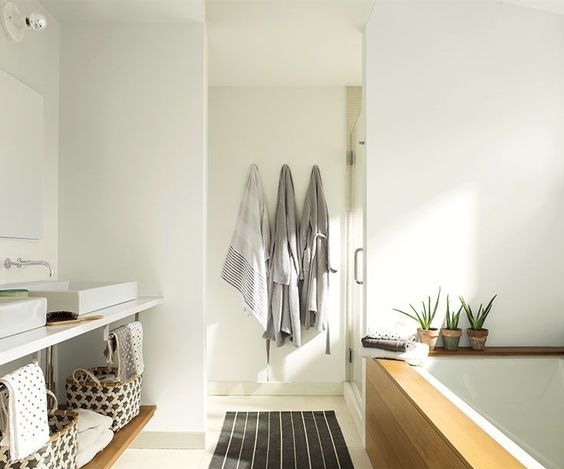 Chantilly Lace OC-65 creates a clean slate while playing up the wood elements in this fresh and clean bathroom oasis. 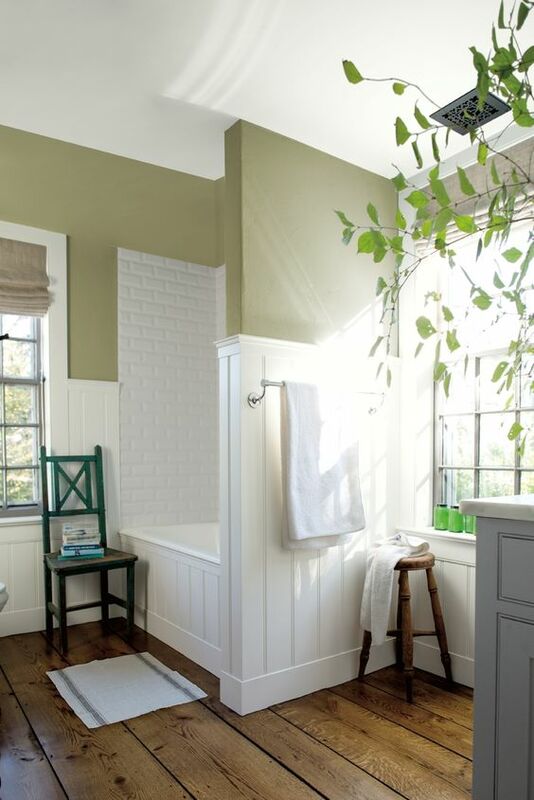 A fresh, spa-like green paint colour is perfect for a master bathroom - like this sophisticated bathroom renovation which uses Bassett Hall Green CW-480. Harwood Putty CW-5 is used on the ceiling and woodwork. 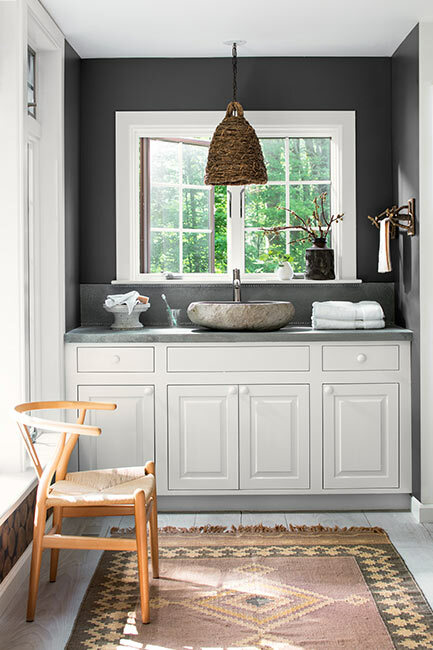 The cabinet is painted in Slate CW-700. 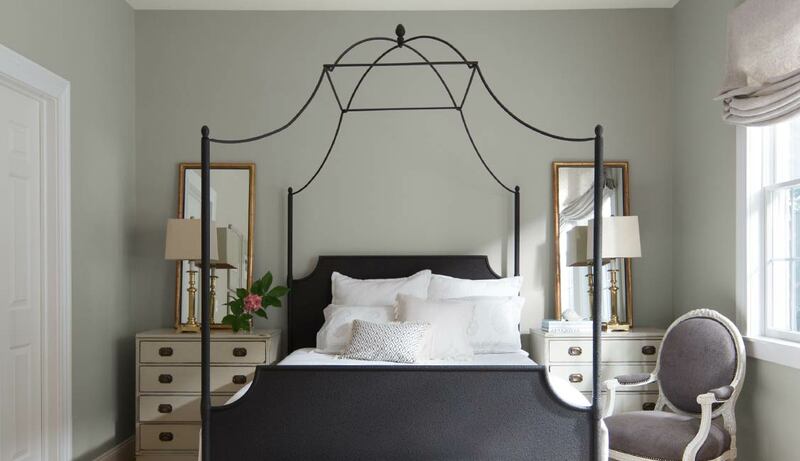 This peaceful bedroom scheme pairs the timeless shade Gray Owl OC-52 alongside Simply White OC-117 on the ceilings. The beautiful whitewash effect of Harwood Putty CW-5 is the perfect traditional bedroom paint colour for a clean and calming space. Here it is teamed with Bruton White CW-710 on the woodwork and Slate CW-700 on the door. 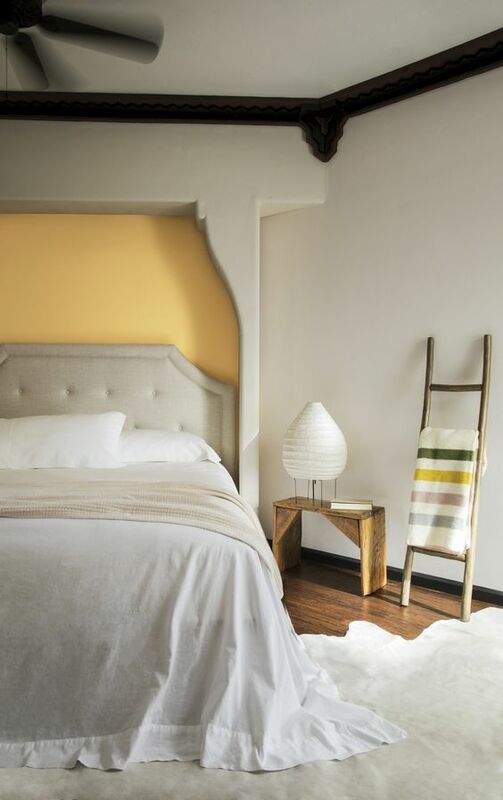 A golden yellow paint color showcases the dimension of the unique design of this bedroom. 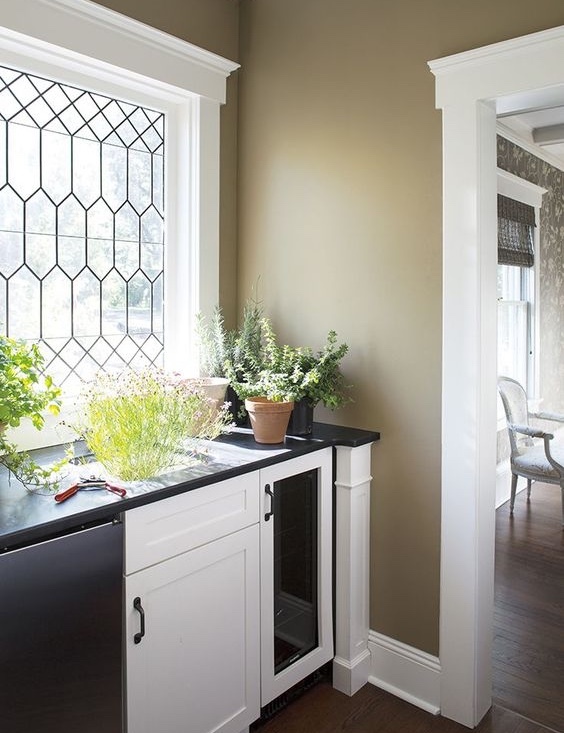 York Harbor Yellow 2154-40 offers a nice pop amid a neutral colour scheme featuring Baby Fawn OC-15 on the walls. 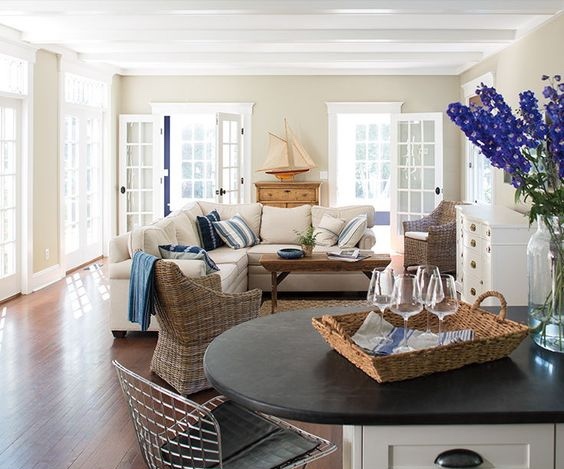 Yarmouth Blue HC-150 is a beautiful base to create a tranquil, seaside mood. Here it is used alongside White Opulence OC-69 on the woodwork and ceiling. A warm paint colour like Pristine OC-75 brings the sense of a sunset on the beach. With a colour reminiscent of seashells and sand, you'll be sure to rest easy.